This past weekend, I was tasked with figuring out how to make a chocolate cupcake which would not only be dairy, egg, soy, gluten, and nut/peanut free but which also could not include any sweeteners like sugar, agave, honey, molasses, maple syrup, stevia, etc…. And of course, the recipient wanted the cupcakes to be fudgy and “healthy” as well. Folks who have food allergies know how difficult it can be to find and/or make desserts which are free of whatever one can’t eat. When you add to that difficulty, though, that it has to be vegan and have absolutely no sweetener other than fruit, things become exponentially more complicated for ensuring the baked product tastes good. Not one to give up, however, I figured out a way to make exactly what was ordered… a fudgy, dark chocolate cupcake which had some healthy greens mixed in and which used only fruit sweeteners. What came to my rescue was an apple butter pure fruit spread – apple butter sweetened only by fruit and no sugar. The result was quite tasty, even though it wasn’t sweet. Preheat the oven to 350 degrees and line a muffin tin with 12 cupcake liners. Mix together the gluten free flour, greens, cocoa powder, baking soda, baking powder, and salt. Set aside. Mix together the water, oat milk, avocado oil, apple butter, and vanilla. Add the dry ingredients to the wet ingredients, along with the vinegar and whisk together until well blended. Divide the batter evening among the twelve cups. The cupcake liners will be filled almost to the top. Bake in the preheated oven until the cupcakes puff and a toothpick in the center comes out clean. Mine took 20 minutes. 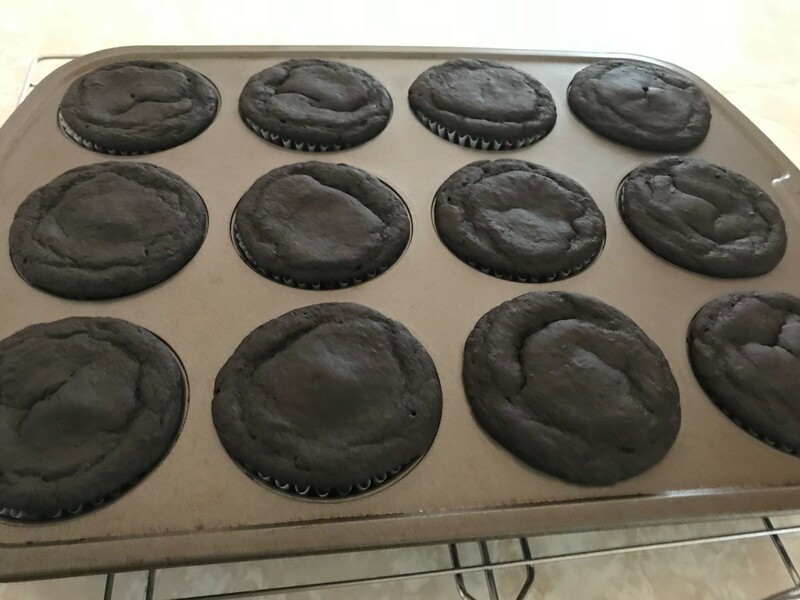 Remove the muffin tin to a wire cooling rack and allow the cupcakes to cool about five to ten minutes in the tin before removing them. They will collapse a bit, but that is what makes them fudgy. Remove the cupcakes from the tin and cool completely. They keep well in a covered tupper ware.